Finally I’ve reached the half way blogging point of my Japan trip. Took me 6 months since my trip back in Nov-Dec last year to reach this mark. LOL Anyway, I’m planning to complete this travelogue ASAP, hopefully before November so that those planning this trip for autumn can get some tips from my Japan posts. On this day, we’re leaving Kyoto for Fujikawaguchiko. It has been my lifelong dream to see Mount Fuji with my naked eyes and there’s no way I would come to Japan and skip it. 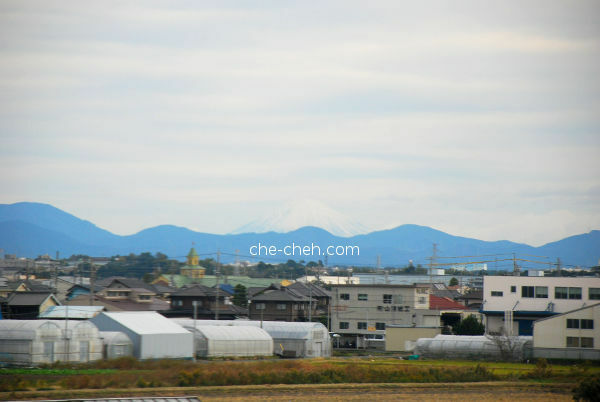 There are many places where one can view Mount Fuji. The famous of the lots are Hakone, Kamakura, Lake Kawaguchi, Gotemba, etc. I choose Lake Kawaguchi (Kawaguchiko) which is located at Fujikawaguchiko (town) because I think it has the best overall view of this gigantic mountain. This is based on the images I found in WWW. 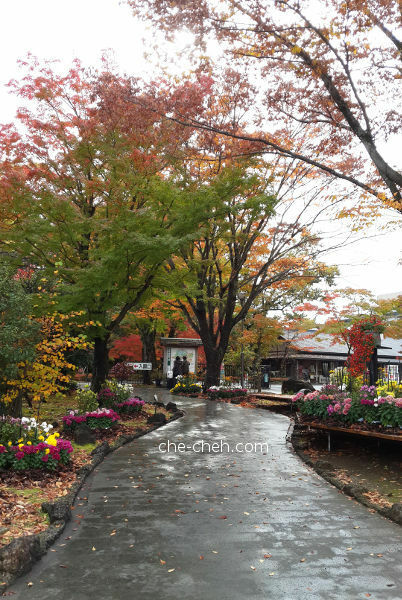 Fujikawaguchiko is located at Yamanashi prefecture. To come here from Kyoto, I took shinkansen from Kyoto Station to Mishima Station. 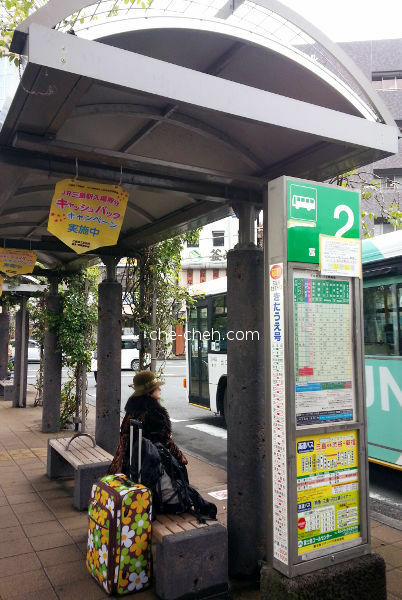 And from Mishima Station, I boarded a bus to Kawaguchiko Station. Sounds easy, right? Come now… I’ll describe the journey in detailed. When I was in Osaka on day 2, I visited the JR ticket office in Osaka Station and bought advance Shinkansen tickets for the Kyoto-Mishima route. I don’t like buying tickets at the last moment due to the probability of tickets selling out and then having to change schedule and everything. It’ll wreck the holiday no doubt. So I got it in advance. Also, if you’re in a group, it’s better to buy in advance so the probability of sitting together is higher. We woke up at 4.20am on day 8. Had our breakfast (I ate tuna egg sandwich), proceed to give one final check with our luggage and then check out from Len Kyoto. Check out was easy. Just drop the key at the reception (no one was there) and exit via their side door. Then we crossed the road and waited for taxi at the bus stand at around 6.20am. Thankfully, we managed to flag one down in less than 5 minutes. When I sent an email to Len Kyoto before reserving our rooms, they told us that they can book a taxi for us. But when we requested them to book a taxi for us on day 7, they told us to just wait for one. Taxi fare from Len Kyoto to Kyoto Station is 830 yen. 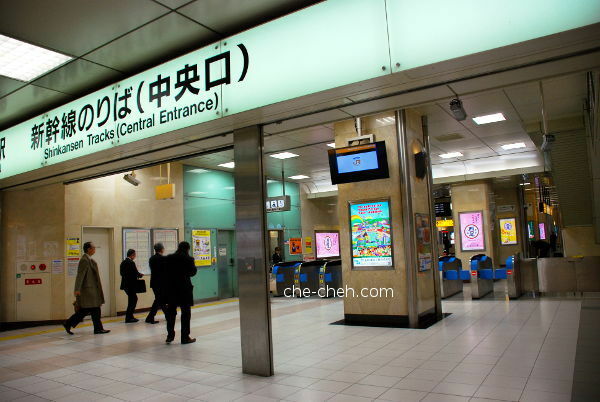 The fare is exactly as when we took a taxi from Kyoto Station to Len Kyoto on day 4. The taxi driver asked us where we’re going in Kyoto Station and then dropped us at Hachijo dori side since it’s the nearest to the shinkansen tracks. The journey took 10 minutes. 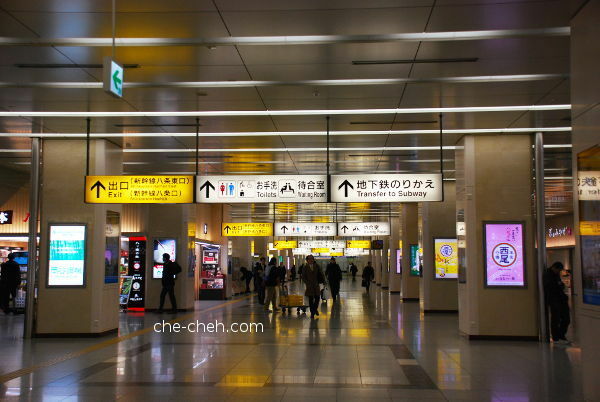 Enter here for shinkansen (bullet train). This gate is for regular ticket which is your base fare ticket. We don’t have one. 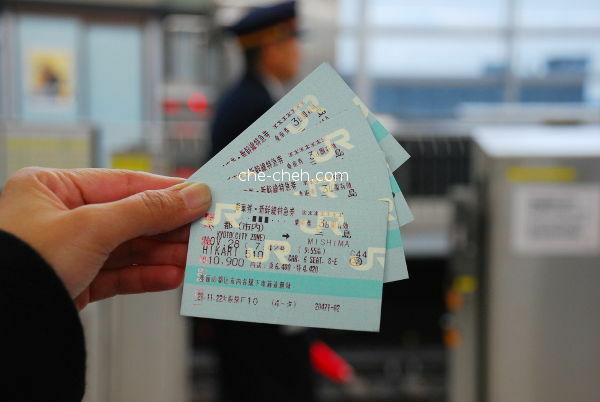 We only have one type of ticket which is the shinkansen ticket. So we just showed the operator our tickets and they opened the gate to allow us through. Walk straight up for toilet, shops and waiting rooms. Our shinkansen track is on the upper floor via an escalator on the left. 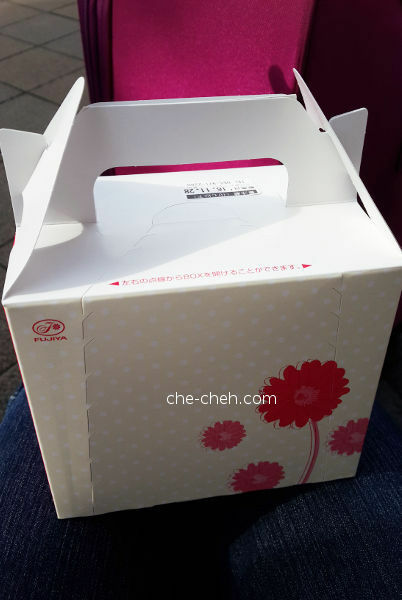 We bought ekiben (railway boxed meal) at one of the shops and proceed to the waiting room. When it was nearly time, we proceed to track 12. This time we used our shinkansen tickets to pass the shinkansen ticket gate. How did we know it was track 12 since it wasn’t printed on the tickets? Check the display signboards in the station or hyperdia.com (in advance). The ticket will show your car number and seat number. When you reach the track, look for the car number as it’s very visible and wait at that area. Ours was car 6… and in this photo I bet you can see a 6 at the middle (almost) of this photo. Shinkansen tickets from Kyoto to Mishima. The ticket cost 10,900 yen pax (about RM400+). Yup, it’s not cheap. 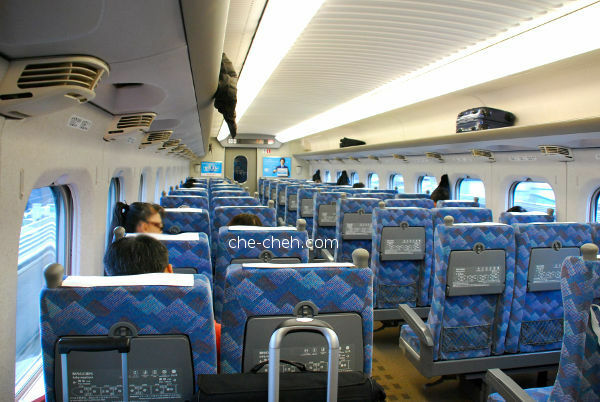 Despite the fact that I will be riding my very first shinkansen in Japan, I tried to reduce my shinkansen ride as much as possible during the planning stage. Throughout my 16 days in Japan, this is the only time I ride a shinkansen. Talk about stinginess… Nope! I say this is clever budgeting. Ohh and there’s no need to buy Japan Rail Pass, which is actually a waste of money in my opinion, unless you travel every 2-3 days to new places via shinkansen, then it’s worth it. If you read my prologue for this trip, you’ll know the reason I took an open-jaw route is because I want to reduce my shinkansen ride. Besides, there’s no point to ride a shinkansen back to where I first arrived as I can fly home from my latest location (provided it has airport nearby). 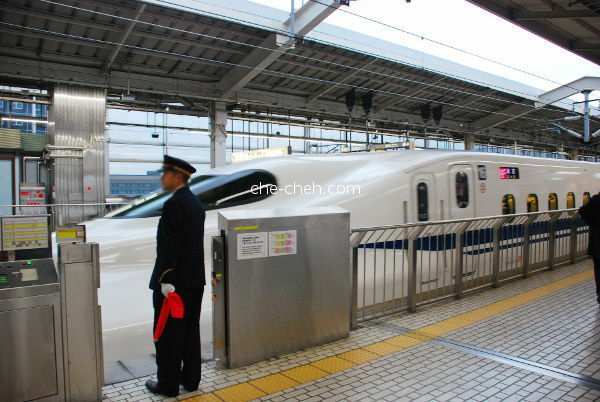 Ahh the mighty bullet train that I’ve only seen in TV, newspaper, magazine and online was right in front of me. This was an earlier train right before ours. On board Hikari 510 which departed from Kyoto Station at 7.42am and will arrive at Mishima Station 2 hours 13 minutes later with multiple stops and zero transfer. On different time/train, sometime you need to transfer to another train/track. The bullet train arrived few minutes earlier. And yes, it was quite empty but as the train stops at several stations, more and more passengers filled the empty seats. 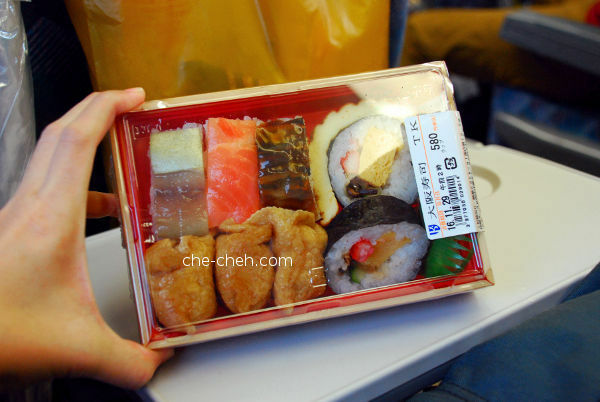 Our ekiben 駅弁 (railway boxed meals) bought earlier. Cost 580 yen for 8 pieces. Yum-yum! There are toilets, washrooms and even special spaces for your luggage in the train. For us, we thought it’s better to have our luggage together so we placed ’em in our leg areas. No doubt it was a bit troublesome but better be safe than sorry. The train’s seat and the car were comfy and clean. 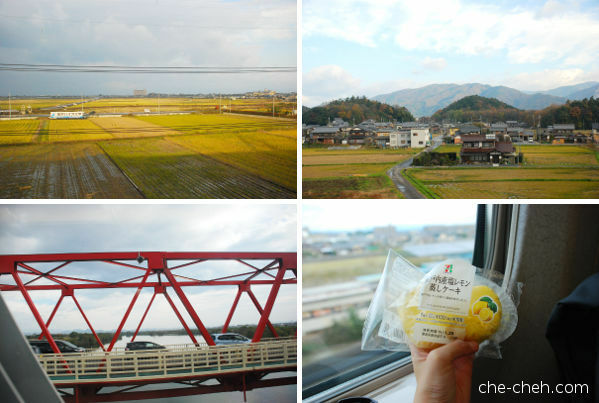 Scenes seen from bullet train headed to Mishima… sea of yellow fields, reddish-green mountains and hills, bridges and along the way I snacked on this lemon cake. Saw this impressive structure called Solar Ark at Anpachi, Gifu about half an hour into our train ride. Then I saw it when I was hanging out near the loo (just came out from there and needed to stretch). It’s Mount Fuji!!! Fuji san my love. 😍😍😍 I quickly ran to my seat and grab my handphone because it’s much easier to grab. Here’s the same photo but I manipulated it so it’s clearer now. My first peek at Mount Fuji and I’m in love. This was at 9.17am (1 hour 33 minutes into our train journey). Here’s another one. 😍 This one was taken 8 minutes later near Hamamatsu. 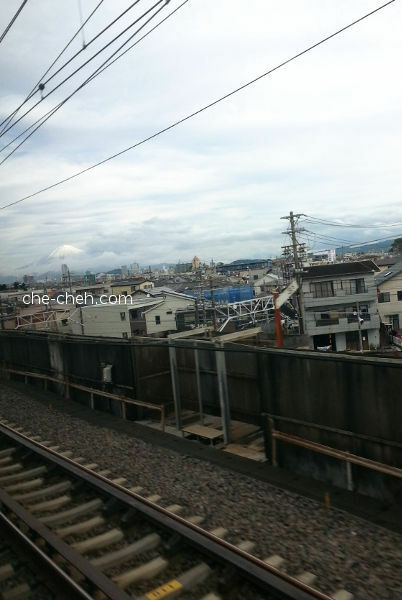 We reached Mishima Station few minutes early. Time was around 9.50am. Actual arrival time is 9.55am. 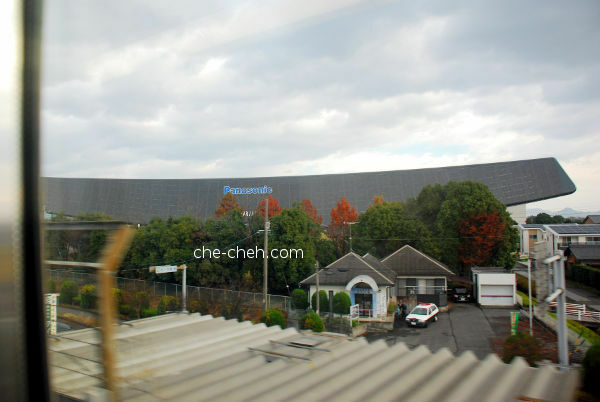 This is Mishima Station taken from across the road. 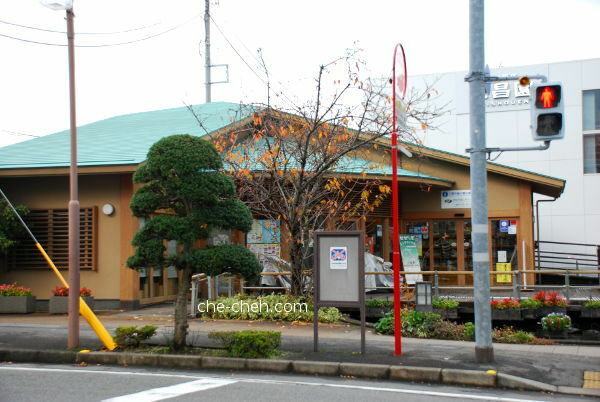 This is Mishima Tourist Association located on the left of Mishima Station (facing station). We went in here to take some brochures regarding Mount Fuji and Fujikawaguchiko. There’s a toilet at the back of this building. From Mishima 三島市, we’re going to take a bus to Kawaguchiko (Lake Kawaguchi). The bus is operated by Fujikyu. Two months earlier (when reservation were opened for booking), I had bought and paid for the bus tickets. I bought the tickets at japanbusonline.com and they emailed me the e-tickets right after that. 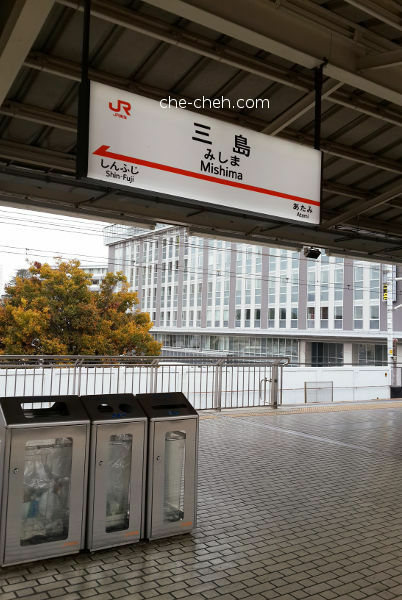 When I reached Mishima Station, I visited their ticket counter to reconfirm our booking. 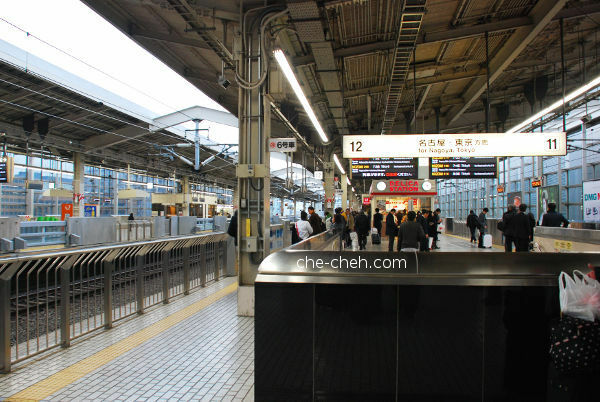 Our ticket fare from Mishima Station to Kawaguchiko Station is 2260 yen pax. Fujikyu Yamanashi bus ticket counter on the left of Mishima Station (facing station). 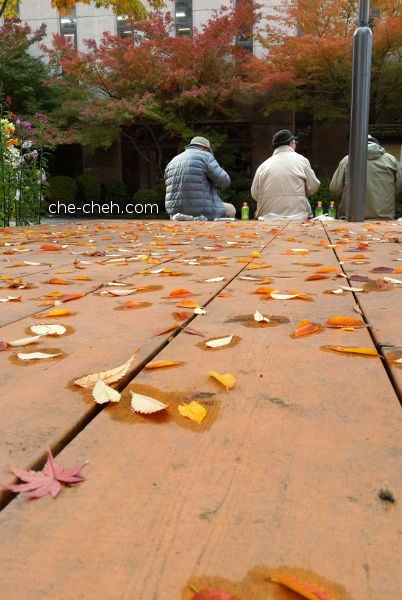 It’s located near to Mishima Tourist Association. I showed the lady my printed e-tickets (email) and she wrote down our seat numbers on the paper. You can also buy the tickets at the counter but of course if possible get the tickets as early as you can to prevent any travel hiccups. After that was settle, we went looking for food and thankfully we found one very near to the ticket counter. It’s actually inside Mishima Station. 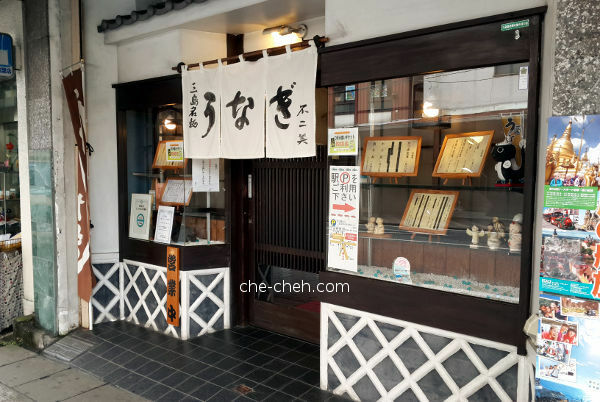 We ate kakiage soba at Meibutsu Mishima Soba 名物 三島そば. Click the link to read more. We only have 2 hours in Mishima and after having lunch, we only have an hour left before our bus arrived. We decided to split up. 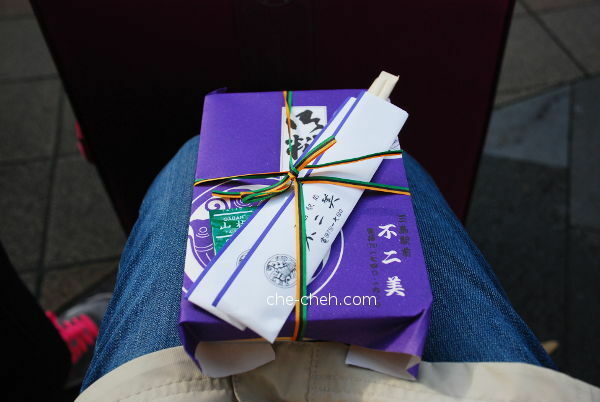 Those decided to stay at the station and look after the luggage and the rest, buying snack for our journey ahead. You can actually keep your luggage at the Mishima Tourist Association but it will cost you 500 yen per piece of luggage. Since some of us decided to rest, so we just have them look after the luggage. There are plenty of seating outside Mishima Station. 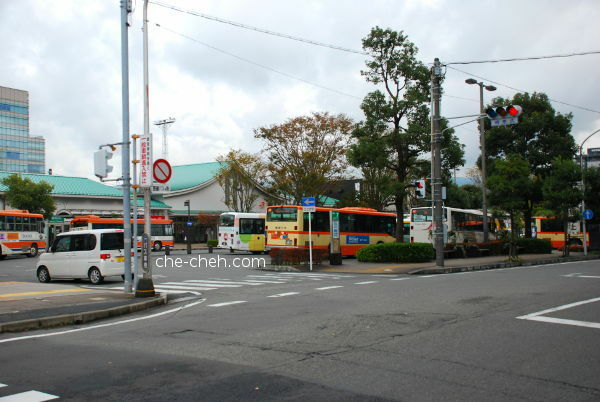 The reason we hanged out at Mishima Station was because the bus will depart from there as well. 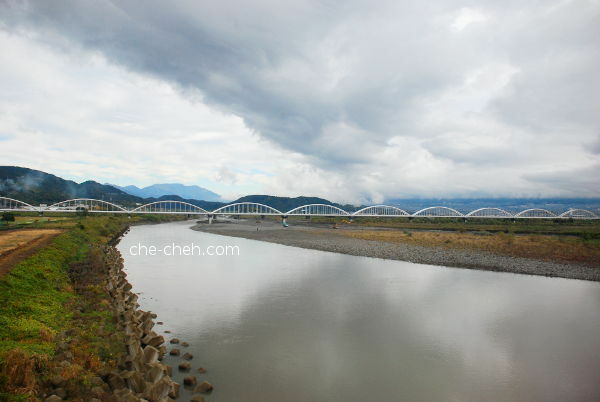 As Mishima is very near to Mount Fuji, the eels there benefited from the melted snow water. So unagi (eel) is a must try when in Mishima. Since we’re out of time, we settled for a restaurant that’s near the station called Fujimi. 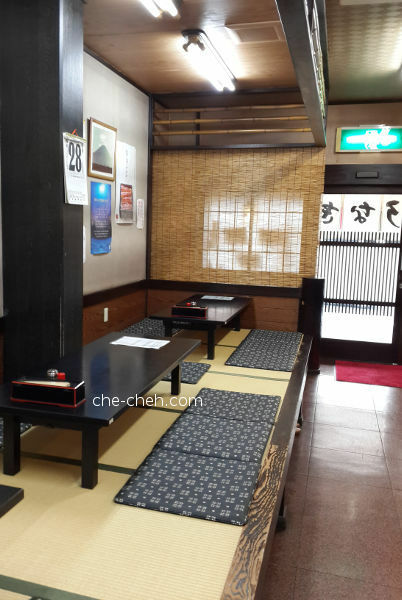 If you have more time, go try this unagi place called Unagi Sakuraya. Upon entering, there is some kind of funky smell and the place was empty except for an occupied table (time was 11.20am). As we were heading back to the station, we saw Fujiya across the street from it. 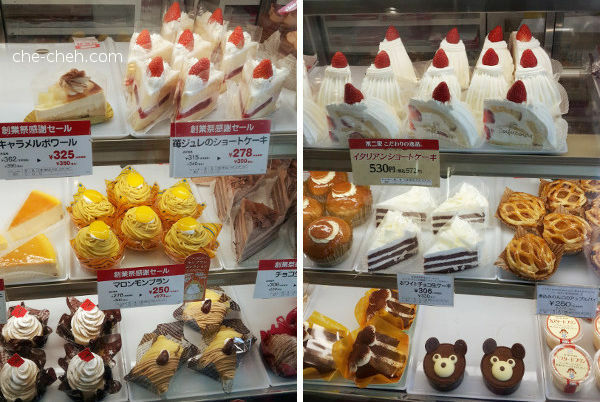 Yup, these cakes were calling us. Safely on our lap. We only bought a piece of cake. To be revealed in the next post. 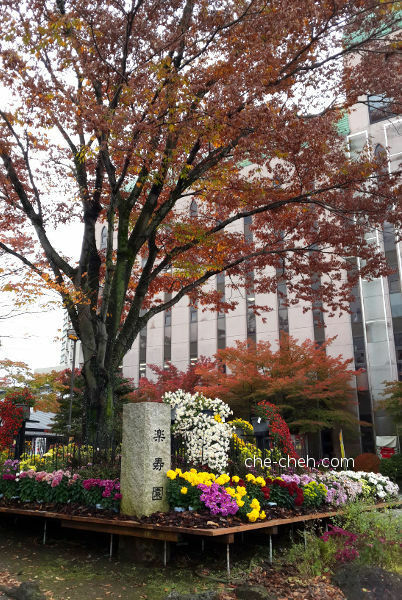 By this time I wanted to hurry back so that we can dig into the unagi… but got sidetracked by this beautiful park called Mishima City Park Rakujuen 三島市立公園 楽寿園. 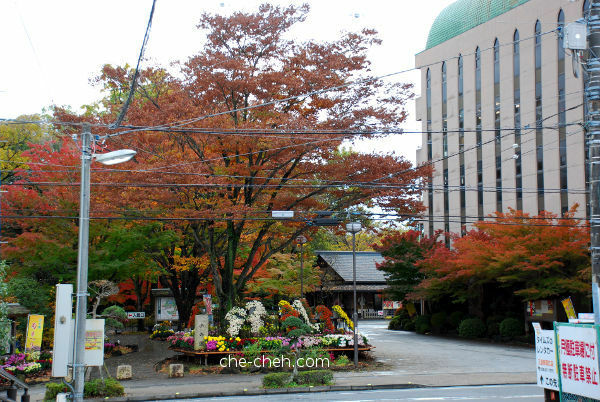 Rakujuen is located right across Mishima Station and this is one of the entry point to the garden. A gorgeous path leading to Rakujuen. Locals enjoying each other’s company. 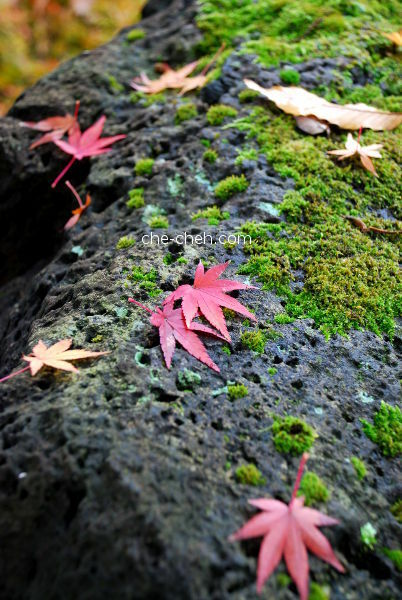 Maple leaves on a moss-filled lava rock. Why is there lava rock here? 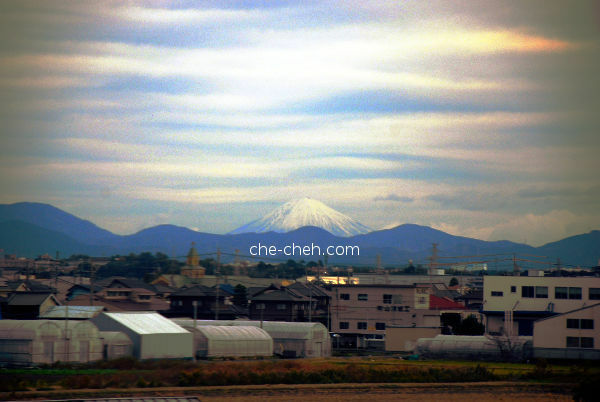 Thanks to Mount Fuji when it erupted several thousands years ago. There are many more inside Rakujuen. We didn’t went in the park, only outside as it was nearly time for our bus. If I’m not mistaken, there’s an admission fee. One last photo. 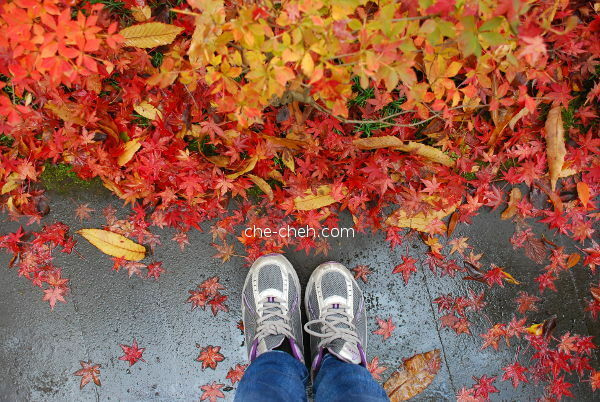 Deep-red autumn at Rakujuen’s entrance! 🍁❤️ So beautifulllll. You can see the path is wet. It was drizzling. I wish I have more time to explore Mishima. When I was planning this trip, I so wanted to stay a night here but other places were begging for attention so I had to leave this one out. Next time then! Bus stop no. 2 outside Mishima Station. Our Fujikyu bus is scheduled to depart at 12.10pm and it arrived few minutes early. We departed a couple of minutes after that. There were couple of empty seats when we left. Bear in mind, there’s no toilet in the bus. The journey will take about 1 hour 35 minutes to Kawaguchiko Station. 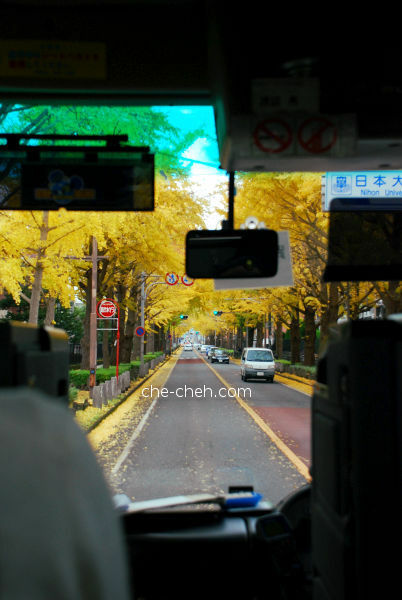 Couple of minutes into our journey (still in Mishima area), we were greeted by this ginkgo trees lined road. So pretty! It reminded me of Osaka. I think I’ve wrote enough. This is just part 1. Stay tuned for day 8, part 2 ya.